"A grove of giant redwood or sequoias should be kept just as we keep a great and beautiful cathedral." To say Teddy Roosevelt was a wise man is an understatement. At the turn of the 20th century, in a time of rapidly increasing industrialization and the rapacious plundering of the natural world, Roosevelt got it. The giant sequoias tucked away in the folds of California’s Sierra Nevada mountains could have been a source for millions of wood planks. Instead, they’re the source of millions of memories and a reflection on what it means to be human, thanks to efforts of conservationists, including Roosevelt, more than a century ago. The coarse-grained wood encased within the sequoias’ burnt orange trunks tells a history that stretches well beyond our individual lifespans. These trees have lived through the birth of Christ, the Spanish settlement of the U.S., and the California gold rush. Staring up from their gnarly base to their bushy crowns nearly 300 feet above the forest floor is to share a sense of wonder experienced by generations. It’s impossible not to be awed by their size — after all they’re among the largest living things on the planet. When a roughly 49,000-acre chunk of land was set aside in 1890 as Sequoia National Park — the nation’s third national park — it was done so with the intention of having the mighty sequoiadendron giganteum inspire awe for centuries to come. And in 1916, when the National Park Service came into existence, that mission spread to a growing quiltwork of natural and cultural wonders across the U.S.
Now, as the National Park Service celebrates its 100th anniversary this summer, these irreplaceable sequoias face an uncertain future. Sequoia National Park has grown to more than 400,000 acres, but global warming has wormed its way into those boundaries and is pushing sequoias’ climate into a new and tenuous state. Rising temperatures, an increase in extreme dry years and disappearing snowpack are altering the conditions that have allowed these trees to thrive for eons in a thin band along the Sierras’ western flank. The ongoing California drought has hit the southern Sierras hard and increased the risk of more destructive wildfires, and less water availability in the summer. Researchers have already documented a dieback in older trees during the drought, one of the many “a-ha moments” that point toward future challenges for the Giant Forest. The average annual temperatures in the park are projected to rise around 7°F by 2100 if carbon pollution isn’t slowed, further disrupting a delicate balance. With only 65 groves of sequoias in the world — most of them clustered in and around Sequoia National Park — climate change poses a huge threat to these trees and the ecosystems they support. To lose these majestic giants would be not only a blow to the National Park Service’s mission, it would also mean losing a little piece of us. Sequoia National Park isn’t the only place to feel the heat. The whole system of National Park Service-managed sites, which includes 59 national parks and 352 other monuments, battlefields, trails, historic sites and other crucial pieces of American and natural history, is facing threats from water shortages, too much water, rising temperatures, and the onrush of seas and ocean acidification. Those threats and how the National Park Service manages them hit close to home for almost all Americans. Every state has at least one National Park Service site. Last year, more than 300 million tourists visited the national park system. With Memorial Day right around the corner, that season is about to lurch into full gear as millions go to find their park. Amid growing partisan rancor and arguments about the role of government, national parks are one thing most Americans can agree on. The National Park Service has a 84 percent approval rating. That’s because parks embody shared cultural values most Americans relate to and crave. They’re neither red nor blue, but rather communal spaces that allow individuals to craft their own experiences and narratives. They tell hopeful stories about innovation, and confront harder truths of American history, from the Civil War to the Civil Rights struggle. Oh, and America came up with them first so there’s probably a little home country pride involved. Climate change isn’t the first challenge to the wonders that national parks protect. Air pollution, the threat of oil and gas extraction on their borders, budget woes and the arrival of non-native species have all put the pinch on parks. But climate change represents an existential threat the likes of which the National Park Service has never had to deal with. Americans have called our parklands home since Yosemite was first set aside as public land in 1864 and Yellowstone was dubbed the nation’s (and for that matter, the world’s) first national park in 1872. Teddy Roosevelt used the newly created Antiquities Act to declare Devil’s Tower in Wyoming the first national monument in 1906. And in 1916, Woodrow Wilson signed the Organic Act, which created the National Park Service as a way to manage the growing network of parks and monuments across the nation. These places and the subsequent 409 additions to the National Park Service domain that have followed were set aside as safe havens from the rapidly industrializing world. But they’ve been unable to keep climate change — the most direct negative impact of the Industrial Revolution — out. Impacts are showing up on parks’ front doors and in more and more cases, inviting themselves in and rearranging the furniture. In some parks, climate change is adding new furniture to the rooms and throwing the old stuff out at a rate not seen in millennia (and likely longer than that). Climate change has already cranked up temperatures in parks. The roughly 84 million acres under the National Park Service’s purview have warmed faster than the rest of the U.S. since 1895. That’s largely because there is a glut of national park sites in the Southwest and Alaska, two of the fastest-warming regions of the country. Some of the changes are visceral and obvious. Glaciers that dominate the landscapes of the northern Rockies and Alaskan national parks are dwindling, and in some places, such as Glacier National Park, they could be all but gone by century’s end. Sea level rise coupled with Hurricane Sandy shut down the Statue of Liberty and Ellis Island for months and caused millions of dollars in damage. In Alaska, disappearing sea ice and melting permafrost are destroying archeological sites, their treasures and history lost to the ocean. Climate change’s impacts also extend beyond park resources to visitors themselves. Warmer weather means there will likely be an uptick in the number of visitors each year, particularly in what are currently the shoulder seasons, according to NPS research. The main visitation season will grow on average by 13-31 days. That would be a huge boon for gateway communities as visitors spent $15.7 billion within 60 miles of parks in 2014, a number that should rise with more and more people passing through nearby towns. At the same time, park managers will have to figure out how to accommodate more people and a longer season. Some parks, like Glacier National Park, are already grappling with these challenges. April visitation numbers were off the charts following a warm, dry winter last year. That 100-year-old phrase, however wonky, still resonates strongly for NPS employees today. But the trials and tribulations the parks face now are beyond anything Woodrow Wilson could’ve imagined when he signed the Organic Act. Within the program they refer to the growing host of climate issues as “gnarly problems” because there are no easy answers. And often times those problems run deeper than just the iconic species parks protect. In response, the NPS has turned toward scenario planning to address these challenges. It’s a technique most commonly associated with the military and big businesses trying to plan for a variety of future possibilities. For the NPS, it’s the perfect tool to address climate change because of the diversity of land that the agency protects and the variety of impacts and management decisions it faces due to climate change. As the NPS turns 100 years old this August, we’ll dedicate the next several months to looking at how climate change affects our shared heritage and what the agency is planning to do about it. Because these places are in many ways ground zero for climate change, there is no shortage of stories to be told. There are impacts you can already see on your summer vacation (hint: it’s more than disappearing glaciers), plans being hatched and gnarly questions that will need to be addressed. These stories will span places from coasts to canyons, delving into what makes parks like Everglades and Grand Canyon spectacular and how people are working to protect them from the impacts of our rising seas and our overheating climate. 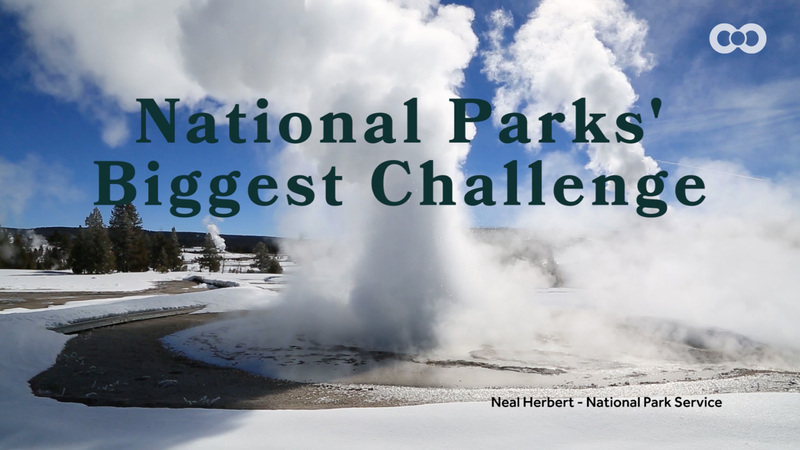 While each park has unique challenges to face, the stories will cut across some of the shared problems and solutions. That includes cutting-edge research on how to adapt to climate change and cataloging and remembering some of the cultural resources we might lose before they’re gone. Parks are also the frontline of climate communication, places where rangers can literally point to the changes most people only read about in textbooks or look at with a skeptical eye when their friends post about it on Facebook. In the end, all of the efforts being made today in the hundreds of natural and cultural cathedrals across the country are what will shape the next century of national parks, and the stories we tell about them. National Parks, the Series . . .
© 2016 Climate Central. All rights reserved.